The myth, the legend, the Link, the Boogieman is very real indeed. The creature of childhood nightmares is creature of habit, if nothing else. Due to biological necessity, the Boogieman must stay true to it's migration cycle the duration of which is seven years. A very deadly killer, The Boogieman is considered the "great white hunter." A hunter you don't want to impede his killing or migration or he will focus on killing you. Despite, the necessity of staying true to his nature he will take every chance he can to kill you before moving on. He likes to take the heads of his victims, so that they can serve as trophies to him. 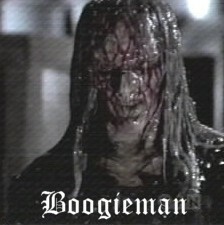 The Boogieman is also a Link that can not be seen by anyone or anything other than Banshees and pre-teen humans due to hormones specific to their bodies. So be extremely careful with this Link, even at the top of your game, you need luck on your side. Lucky for humanity, the only living Boogieman was killed by Nicholas O'Malley, of the Chicago branch of Special Unit 2. Method of killing: Standard Ammo only works if you can see what you are shooting at.